Biaggi’s Ristorante in Deer Park, Illinois, found their inefficient 200-gallon tank could barely keep up with dishwashing demand and they would replace tanks every two or three years. 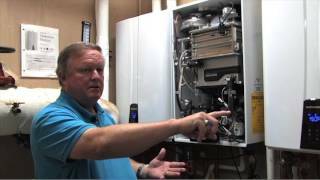 Gregg Bickus of Bickus Plumbing convinced the owners to replace their old system with four cascaded Navien NPE-240 units. The Bickus crew started about a half hour after the restaurant closed and had continuous hot water up and running by 10:30 the next morning. Instant hot water supply: Unlike other tankless systems, the Navien NPE features a buffer tank and recirculating pump to provide an uninterrupted flow of hot water. This prevents a condition known as “cold water sandwich” which sends cold water before the heater reaches full temperature. Durability: Stainless dual steel heat exchangers, a Navien exclusive, last longer than other tankless heaters with aluminum or copper heat exchangers. Stainless resists corrosion from hard water and Navien NPE units don’t have to be cleaned as often other tankless heaters. Faster, less expensive installation: One of the reasons Gregg’s crew could replace the old system so quickly is the ability to use 2″ PVC venting. Gregg said, “PVC is cheaper, available everywhere and all the plumbers use PVC fittings.” Since the NPE uses 2″ venting, PVC can be run in existing vent chases, saving many hours of installation time.